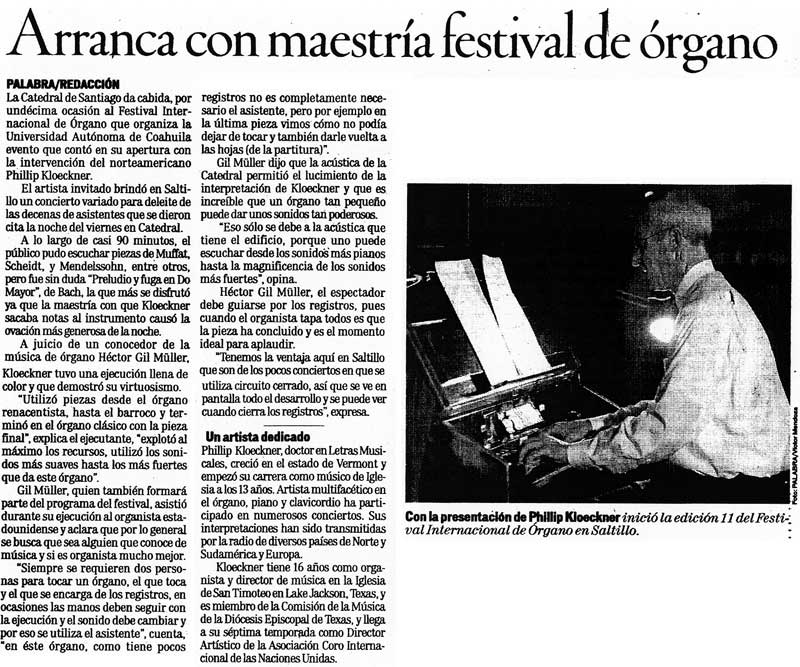 For the eleventh time, the International Organ Festival, organized by the Autonomous University of Coahuila, took place at The Cathedral of Santiago, which was lucky to include the participation of American organist, Phillip Kloeckner, during its opening. The guest artist gave a varied concert in Saltillo to the delight a large group of attendees at the Cathedral on Friday night. For almost 90 minutes, the public was treated to works by Muffat, Scheidt and Mendelssohn, among others, but without a doubt, Bach's Prelude and Fugue in C major was enjoyed most as Kloeckner masterfully drew music from the instrument, receiving the most generous ovation of the night. According to music expert, Héctor Gil Mueller, Kloeckner demonstrated colorful execution, musical talent, and virtuosity. "He utilized pieces from the Renaissance organ to the Baroque and ended up with the classical organ in the final piece", explains Mueller, "He took advantage of the maximum capabilities of the organ, using the full range of sonorities, from the softer to the stronger, available in this organ". Gil Mueller, who will take part in the Festival program as well, assisted the American organist during his execution. He clarified that, in general, this must be someone who knows about music and even that much better if it is an organist. "It always requires two people to play an organ, the one who plays and the one who is in charge of the registers. Occasionally, the hands must continue with the execution but the sound must change, so the assistant is used", tells Gil Mueller. "Since this organ has fewer registers, the assistant is not completely necessary, but, for example in the last piece we saw how he could not stop playing and also turn the pages (of the score)". Gil Mueller said that the acoustics of the Cathedral enabled Kloeckner's shining interpretation and that is unbelievable that such a small organ could produce such powerful sounds. "It is only because of the acoustics of this building, because one can listen from the most piano sounds to the magnificence of the stronger sounds", opines Gil Mueller. Héctor Gil Muller says that the spectator must be guided by the registers since it is when the organist covers all of them that the piece has concluded and it is the ideal moment for applause. "Here in Saltillo, we have the advantage that there are few concerts in which closed circuit is used; in this way, all the activity can be seen through the monitor, including when the registers are closed", he said. Philip Kloeckner, Doctor in Music, grew up in Vermont and started his career as a Church musician at age 13. A multifaceted artist in organ, piano and clavichord, he has participated in many concerts. His interpretations have been broadcast by radio in various countries in North and South America and Europe. Kloeckner has 16 years of experience as organist and music director of St Timothy's Church in Lake Jackson, Texas, and is a member of the Episcopal Dioceses of Texas' Music Commission. It is his seventh season as Artistic Director of the United Nations Association International Choir.